To analyze trends in mountaintop removal mining near Appalachian communities, and the socioeconomic conditions correlated with those trends, we first constructed a set of maps showing the extent of surface mining between 1984 and 2014. We used these maps to examine the proximity of mining to communities in Appalachia, and referenced U.S. Census Bureau data to detect differences in demographic and economic trends that correlate with recent encroachment of surface mines on communities. From there we wanted to gain a better understand of which communities near mountaintop removal mines could be considered the “most at risk.” We created a 1-mile buffer around populated communities in the 53-county coal mining region of Central Appalachia and ranked those communities based on the percentage of land within the 1-mile radius classified as active mining in 2014, as well as the change in that proportion since 1990. 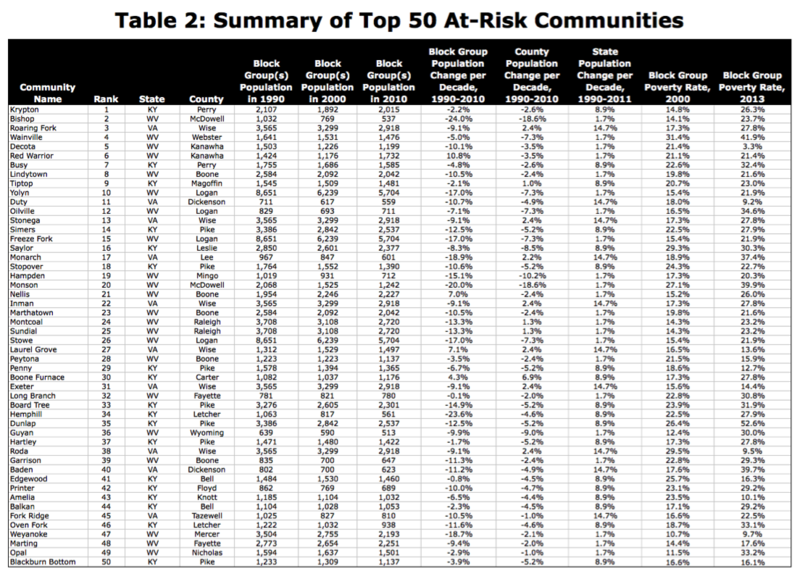 From that data set we compiled a list of the top 50 at risk communities — those that have faced the greatest recent encroachment of mining activities, and are therefore at greater risk of negative health, economic and population impacts. We also created a process to randomly select a set of “no-mining communities” in the 23 counties where the at-risk communities are located, which we then used to compare indicators such as poverty rates and population decline, leaving out any community located in a primarily urban area or which shared a census block group with one of the at-risk communities. The focus on 50 communities is no way intended to exclude or neglect the untold additional Appalachian communities that are threatened by the ongoing advance of large-scale surface mining. 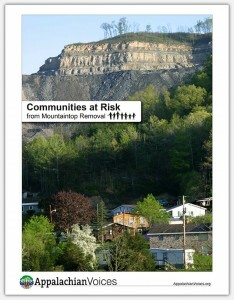 The results and implications of our analysis are described in “Communities at Risk from Mountaintop Removal,” a white paper produced by Appalachian Voices for The Alliance for Appalachia and iLoveMountains.org. More in-depth descriptions of the methodology and the maps and datasets used in this project can be found in that document.